Toss the herbes de Provence herbs together and store in an airtight container. Fill a large bowl with water and squeeze the juice of one lemon into it. Throw the lemon rinds in as well. Work with one artichoke at a time. 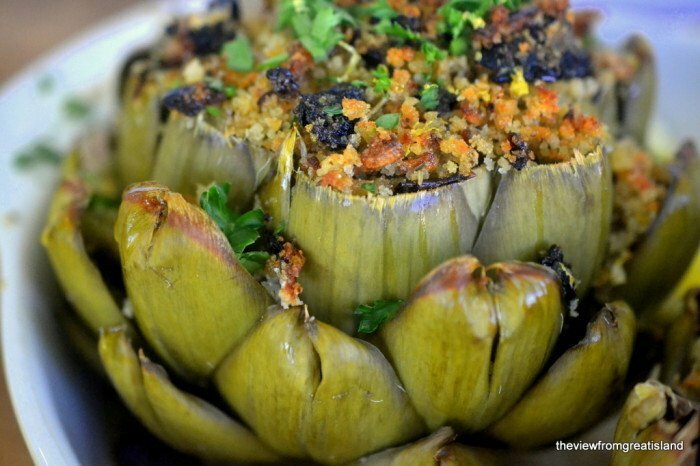 Rinse the artichokes and trim off the stems so they will sit flat. Using a sharp knife, trim off the top inch and a half, cutting straight across. Dip the artichoke in the lemon water after each cut, to prevent browning. You can also rub it directly with the cut lemon. Scoop out the center of the artichoke with a small spoon. A serrated grapefruit spoon works best. First you will scoop out the purplish petals, and then you will get to the 'choke', the very fluffy white hairy stuff. Scoop it all out without removing any of the delicious flesh that lies beneath it. Keep dipping in lemon juice as you go. When you finish with one artichoke, put it into the bowl of lemon water, face down. Meanwhile set a steamer basket in a large pot and fill with just enough water to reach the bottom of the basket. Heat the water to a boil and add the artichokes, face up. Steam them, covered, for 15 minutes, then remove from the pot and set the artichokes into a baking pan. Make the stuffing by heating the olive oil and butter in a skillet and adding the onion, celery and garlic. Saute, stirring often, for 5 minutes. Add the tomato, breadcrumbs, herbes, and salt and pepper. When you add the herbes, crush them slightly between your fingers to bring out their flavor. Toast on medium high heat, stirring constantly, for another 5 minutes. Take the pan off the heat and add the lemon zest, cheese, and parsley and mix well. Taste and adjust the seasonings if needed. Fill the cavities of the artichokes with the stuffing, letting some of the stuffing fall down into the outer leaves as well. Drizzle with a little olive oil. Pour about 1/2 cup of water into the baking dish, and bake, uncovered, for about 15 minutes until the artichoke is tender. Serve hot, sprinkled with more parsley and lemon wedges on the side.